* Soon to be your favorite jacket! * You will want to buy this for your friends too! Eco-repel® - the ecological way to repel water and mud. How it works: Eco-repel® seeks to simulate a duck in nature who can dive underwater and re-emerge with their feathers still dry. Ducks and all water fowl produce an oily secretion that makes their plumage repel water. 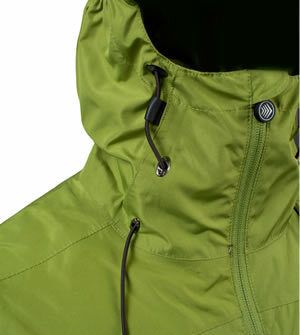 The fabric developed by Schoeller® has an natural paraffin finish that simulates nature's water repellent function. The result is a natural protection that is highly functional based on long paraffin chains that wrap themselves spiral-like around individual fibers, filaments or yarns in a very fine film. This reduces surface tension so that water droplets and even mud with significantly higher surface tension run off simply. The breath-ability is not affected and the feel remains pleasantly soft. The fabric is amazing to wear! 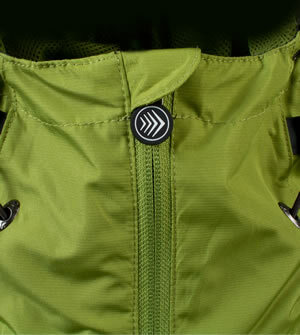 Two-way zipper opens to a fully lined internal mesh that helps with brethability action. 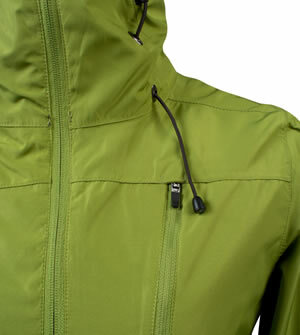 Full Hood Adjusts around Face, two zippered hand pockets that are lined with soft polyester. Zippered Chest Pocket with Button hole on inside to manage cords and ear buds. Neck Gator is adjustable for great fit to insulate the neckline and conserve heat when needed. One Hand Zipper up and down. Zipper Garage keeps inner layers away from zipping action. Aero Tech Designs' Commuter Clothing is designed to be high performance and feature filled. 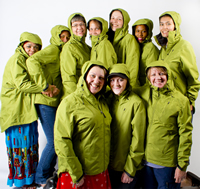 We develop our activewear to protect you from the elements when outdoors living an active lifestyle. See our other types of women's commuter clothes that make daily living a little more comfortable. Eco-repel® complies with the bluesign® standard, the world's most stringent standard in textile production which guarantees the greatest possible freedom from harmful substances and the greatest resource efficiency. As Eco-repel® renounces to the use of fluorocarbons, it is easily biodegradable in accordance with OECD 302 B (80 - 100 %). Schoeller continues to support eco certifications such as bluesign® or Oeko-tex® , and ecorepel® naturally complies with these guidelines. 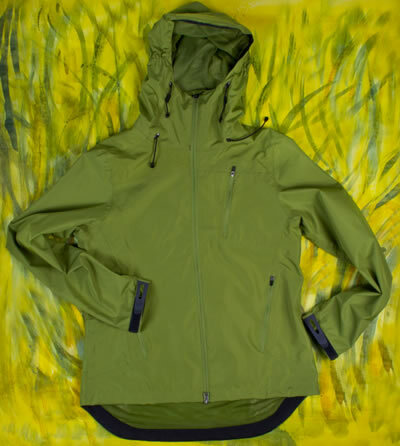 ecorepel® offers modern and clean water repellent inspired by nature. This high-tech finishing is ecologically sound and free of fluorocarbons. ecorepel® passes Oeko-Tex®Standard 100. I've been looking for a cold weather commuting jacket with room for a layer of fleece. This jacket has all the features I wanted. I usually wear a small or medium. so based on other reviews thought I would try the large. Large was out of stock so I went ahead and ordered the Xlarge. Good thing--it's a perfect fit. It seems well made, and I guess I got lucky with the zipper. I like the notpink color too. I have to agree with other reviews about this jacket. The zipper is very difficult to zip up as it gets caught. I returned because I knew I would get frustrated & not wear it. I loved the jacket, hated the zipper. I called customer service & they basically said that is why they are sale priced....supposedly some trick to the zipper. There shouldn't be any "tricks" to a new jacket/zipper, it should work. Disappointed. Returned. Even in heavy rain, I stayed completely dry in this great jacket. Wicked perfectly. Only wish it had quick snaps in addition to zipper...would be easier to quickly pull together if you don't want to deal with totally zipping up! I love this jacket for cycling walking. I just love this jacket and find myself wearing it daily this spring. It is good in the rain and wind. It is much more than a cycling jacket. I ordered one size larger and it fits great. 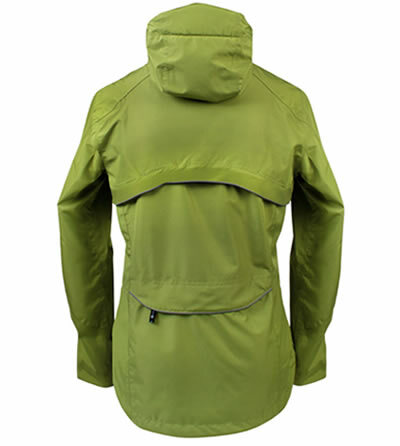 I purchased this jacket to wear as rain gear for an upcoming bike trip. I love the color and thought it was an exceptional value for the price. The photo led me to believe that this was a full zip jacket but in fact I need to slip it over my head. the zipper DOES have a bottom up feature which I will probably use if I need to loosen it around my seat/hips but I can't fully unzip it. So glad that I read comments and ordered two sizes larger than usual. Otherwise would have to return the jacket. The jacket I ordered had a defective zipper. Great customer service mailed me a new one (still has a tricky zipper but can be pulled over head easily. Product defect/discontinued)|CS included a return mail envelope for the first one. Very nice! It is comfortable, seems to repel water well (only wet once so far). My only complaint is that it is hard to get the zipper started at the bottom. And I'd like to comment on the sizing... I usually wear something like XL or 1X. I had to buy a 5X. Wow! really? Also, I like the color and sale price was great! I felt this jacket fits small. I ordered 3 sizes bigger than I normally order so that I could wear warmer layers underneath but it just fits so I can't do as planned. I would have liked the armpit zippers like in a running jacket for ventilation. But the hood is nice, and fits well over all. I received this jacket as a gift right before a big trip to Montana. It was perfect for the mild weather and slight rain we encountered. 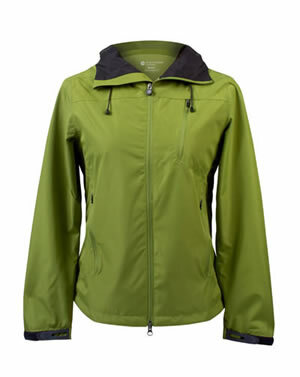 ATV, bike, horse, hike, or just heading out to dinner: you name it - this jacket was perfect for it. Would definitely and highly recommend! 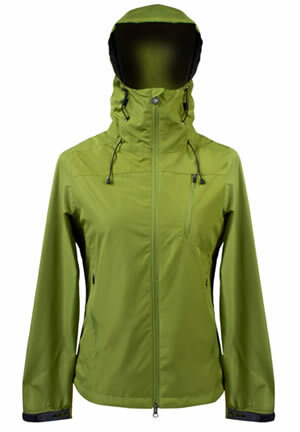 This jacket is great for windy, wet, or cool weather! It's lightweight, the vents are wonderful, it covers the rear even when using drop bars, and I love that the hood stays put. Highly recommended!